Welcome back to Kelly from miskellany. With all of the concerns about the chemicals in plastics, it is best to play it safe and choose nontoxic dishes, cutlery, and cups for children. BPA-free plastic is available, but stainless steel can be an even more durable option for safe drinking. Check out local thrift stores, yard sales, or consignment sales to pick out gently used clothes or toys to give as gifts. Be certain to wash anything you purchase before giving it as a gift, and investigate the safety of toys that you find. Old plastic toys may or may not be safe, depending on the type of plastic and what condition it is in. Choosing long-lasting, chemical free wooden toys is always an excellent choice for children. Many mainstream retailers now offer wooden toys, or you may wish to check sites such as oompa.com. If you are interested in making a practical gift, cloth babywipes are a quick, easy, and inexpensive project, and most fabric stores offer a selection of fun colors and patterns of flannel. A store-bought package of cute washcloths is also a very practical and useful gift for little ones. Purchasing healthy, organic snacks and drinks for children can be expensive. There is always the option of farmer’s market fruit or homemade zucchini bread, but sometimes quick, prepackaged foods are what is needed for a spontaneous snack emergency. Check for dietary restrictions before selecting organic juices, chocolate milk boxes, granola bars, and the like. Little noses can get big colds, and children often don’t like having their noses wiped repeatedly. Handkerchiefs in bright colors or featuring favorite characters could be a practical gift for cold season and a fun toy to imagine other uses for (Picnic blanket? Doll skirt? Head scarf? Hobo pack?). Teething is a painful process that occurs over the span of a few years. Wooden teethers are an eco-friendly alternative to plastics, and they also bring less concern about chemicals, as long as they are treated with food-safe oils. Many folks on Etsy.com sell inexpensive wooden teethers that double as fun toys in shapes such as guitars, giraffes, dolls, and tractors. And speaking of Etsy, homemade toys are an excellent option for young children, whether you feel ambitious enough to craft your own cloth doll or wooden blocks, or whether you choose to purchase homemade toys made by someone else. Such gifts are one-of-a-kind treasures that will be loved longer than mass-produced plastic toys. Instead of buying a toy or gear that little ones will grow out of, give the gift of an experience, such as a trip to the zoo, tickets to the ballet, or a ballpark adventure. Or simply give the gift of your time, by planning a tea party together at home, or organizing a backyard kickball game. 10. 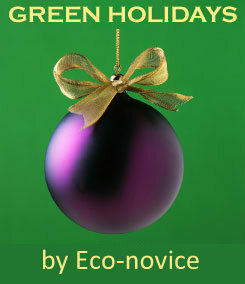 What are your favorite sustainable gifts for young children? Books! Especially for kids. Whereas most adults read a book once and are done with it, kids will read books over and over (well, at least my kid does). If you can, support a local bookstore (whether buying new or used). See if there are any local authors of children's books. Or just gift your own childhood favorites. I agree with all of your suggestions too, particularly #9. My mom has paid for zoo, aquarium, and science museum memberships for us over the years as well as for Kindermusik classes and a French language summer camp as gifts for my son. We've gotten hours of enjoyment from these gifts and they never clutter up our house!